Wong was all in pre-flop with and Borteh called with . The flop was and Borteh's king high remained in the lead. The on the turn sealed victory for Borteh and left Wong drawing dead. Alex Borteh wins Event #34, $225,483, a Corum watch, and his first WSOP bracelet! Brandon Wong takes home $135,615 for second place. Wong raised from the button with and Borteh called with . The flop was and both players checked. The turn was the . Borteh bet and Wong called. The river was the . Borteh decided to value-bet his two pair (even though there were several possible straights out there) and Wong called with his A-Q high. Borteh dragged another sizeable pot and Wong was crippled. He'll almost certainly be all-in on the next hand. Borteh raised pre-flop with and Wong called with . The flop was . Wong checked, Borteh bet, and Wong called. The turn was the . Wong bet and Borteh called. The river was the . Wong checked Borteh bet and Wong folded. Wong was down to around 400,000 after the hand. He's playing aggressively and well, but Borteh just keeps hitting flops on him. The flop was . Borteh led out and Wong called. The turn was the . Borteh led again and Wong raised -- putting significant pressure on his opponent, who must have been hating that ace on the flop as well as the turn card that filled in a straight. After a long think, Borteh called. The river was the . Borteh checked, Wong bet, Borteh called and he dragged in a monster pot. At this point in the tournament, the blinds and betting limits are at an astronomical level relative to the players' stacks and it costs each player about 250,000 to see a hand through to the river. Right now, Wong and Borteh are trading small pots back and forth, grinding it out as they get a feel for one another. Both players are also very experienced. This is Wong's 7th trip to the WSOP and he has already cashed three times this year, twice in limit hold'em events. 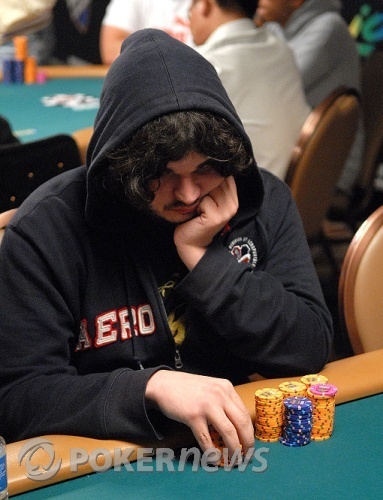 It's the third year at the WSOP for 24-year old Borteh, who cashed in the $2,500 short-handed no-limit hold'em event in 2006. With the board reading , Borteh leads out on the turn and Wong calls. Wong hits the on the river and bets out and Borteh makes what appears to be a crying call. When the cards are turned over, Borteh sees the bad news and Wong drags the pot. Borteh raised pre-flop with and Wong called from the big blind with . The flop was . Wong checked, Borteh bet, Wong raised, and Borteh called. The turn was the utterly magical filling Wong's gutshot staight draw. Wong led out and unfortunately for him, Borteh folded. Wong raised from the button with and Borteh called with . The flop was . Borteh checked, Wong bet, and Borteh folded.